The team readies for the second flight in the week’s flight series. Tonight we are to gaze into the Small Magellanic Cloud, the circumnuclear zone around our Milky Way’s Galactic Center plus a peak at some low mass protostars, the envelopes of interstellar clouds, and massive young stellar objects. We complete the mission briefing, and get on the plane, mingling with the scientist and operators on board waiting for the all-clear. 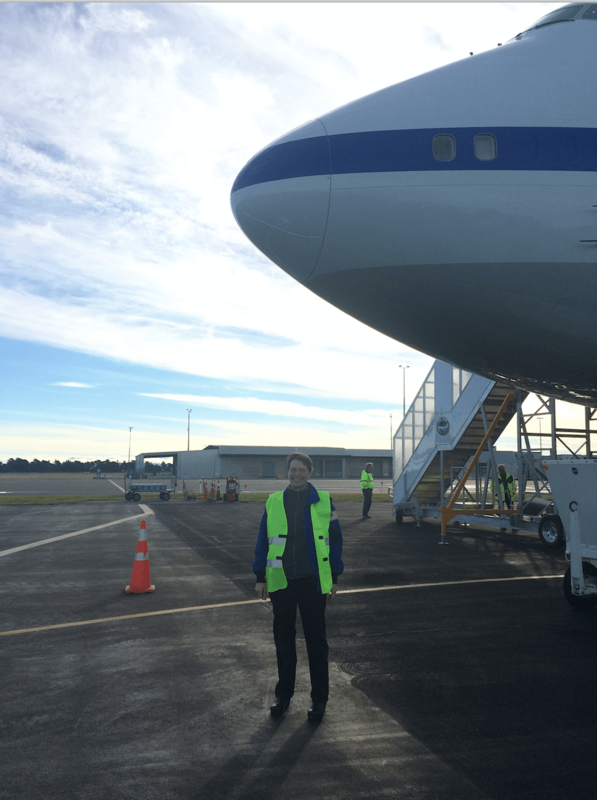 While we waited, I talked with Telescope Operator Sam who started working on SOFIA a few months ago. He came from the world of ground-based astronomical instrument building and operations and got the “operations-bug.” He reflected on how different the SOFIA telescope is compared to a ground-based observatory, and how each leg of each flight essentially “commissions the telescope anew”, doing a new pointing assessment in an environment of changing pressure, something a ground-based or space-based telescope never really has to deal with. I walked with a deeper appreciation for the German-designed and built telescope on the SOFIA Observatory. It is not just one-of-a-kind: it is an engineering marvel one-of-a-kind telescope. 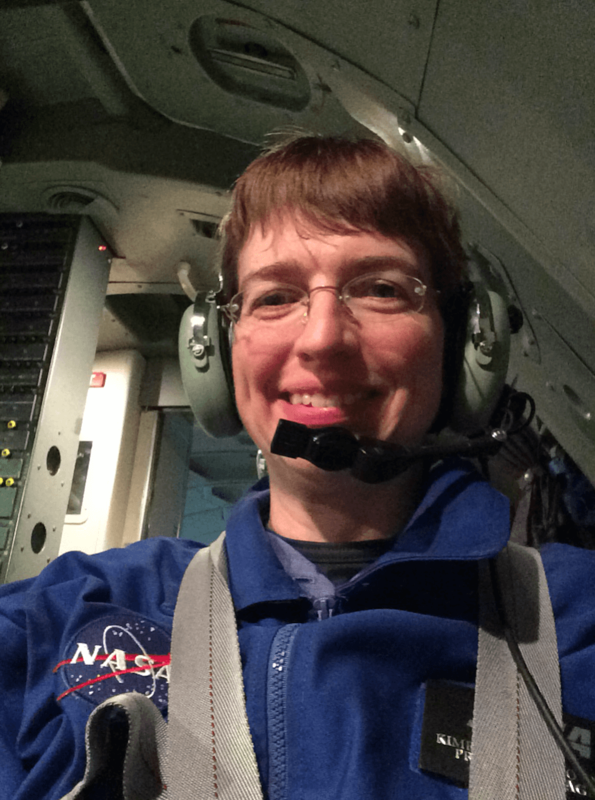 Things do happen with aircraft and when the issue cannot be resolved in a period long to allow us to get back on the skies to intercept our science timeline, we reschedule. Tonight’s science plan gets flown tomorrow night, with a slight delay of four minutes to account for the shifting of sky positions (due to the Earth’s revolution around the Sun in a 24 hr period). 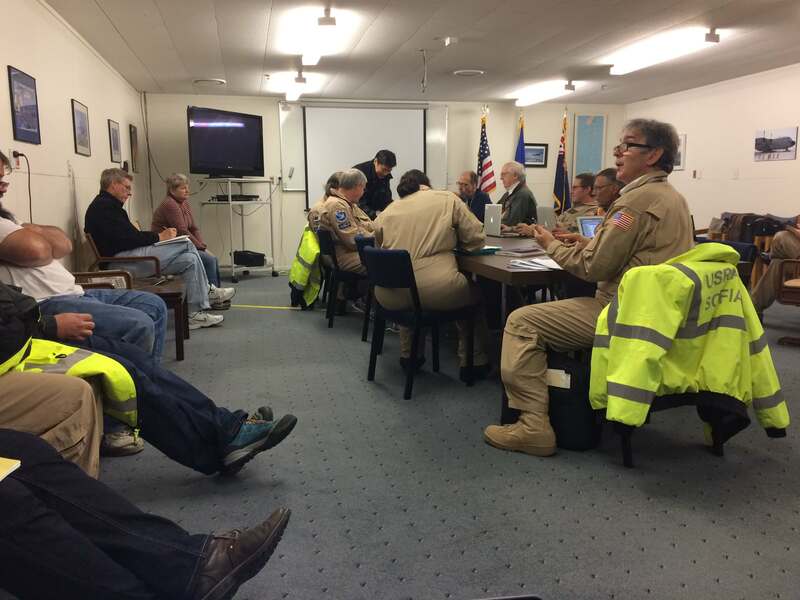 The operations team uses the post-debrief to educate handover items to the ops team for tomorrow’s flight. The stars will be there waiting for us. As with any SOFIA flight, there is a timeline of preparation activities that is followed to ready the plane for science. Aircraft items like refueling and coordination of power transfers need to be scheduled. The crew meets to go over departure and arrival options. 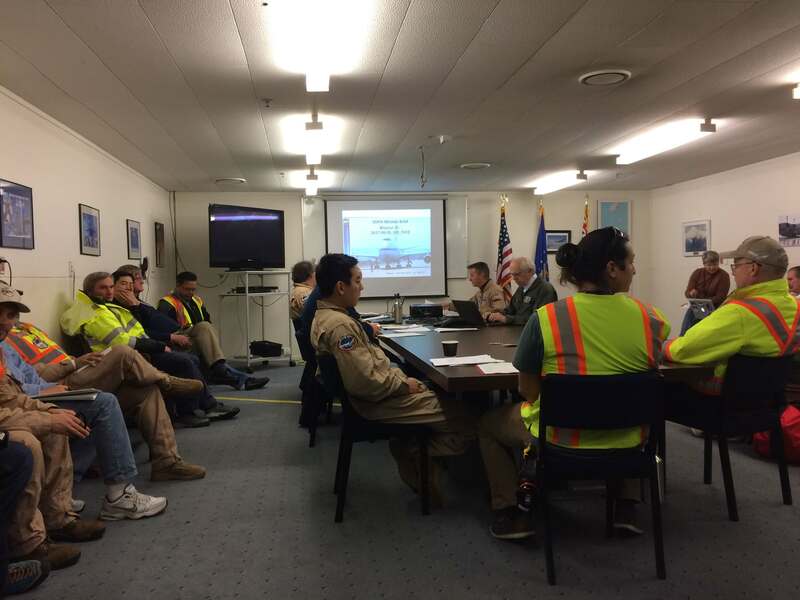 The mission team gets together for an overview of the flight and any one flying has to be present for head count. Soon you find its time to board and the clock is ticking. I found myself fortunate to be in the cockpit again, this time for departure, and pilots Paul & Dean with flight engineer Moose (Marty) certainly were being kept busy with air traffic control. 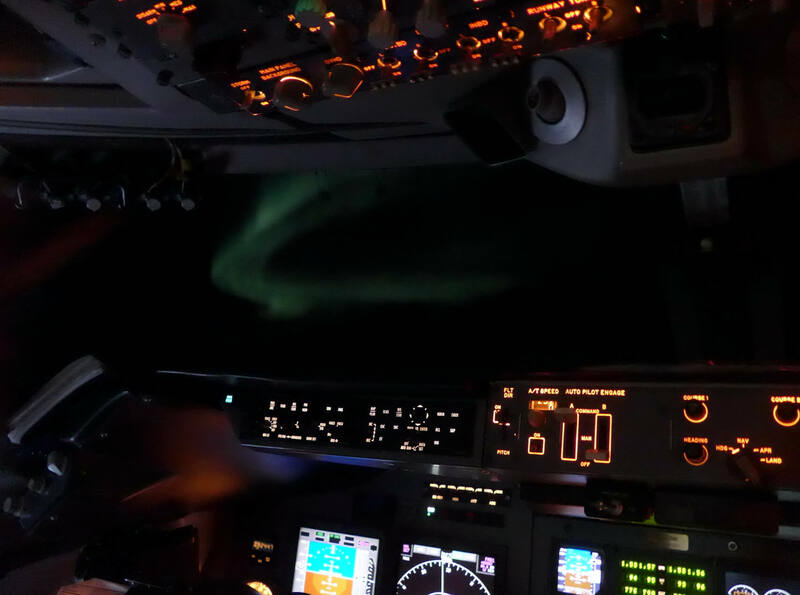 For SOFIA, taking off within a narrow time window is crucial for the flight’s success in terms of the science observations. If there are delays with takeoff, the mission directors need to direct the pilots to intercept the science timelines later and that typically means less science. Not something to make into a habit. At the same time if the plane taxied too early they could find themselves in a queue of planes and then find themselves late in the actual takeoff. It was a fine temporal balance and Paul & Dean handled it smoothly. 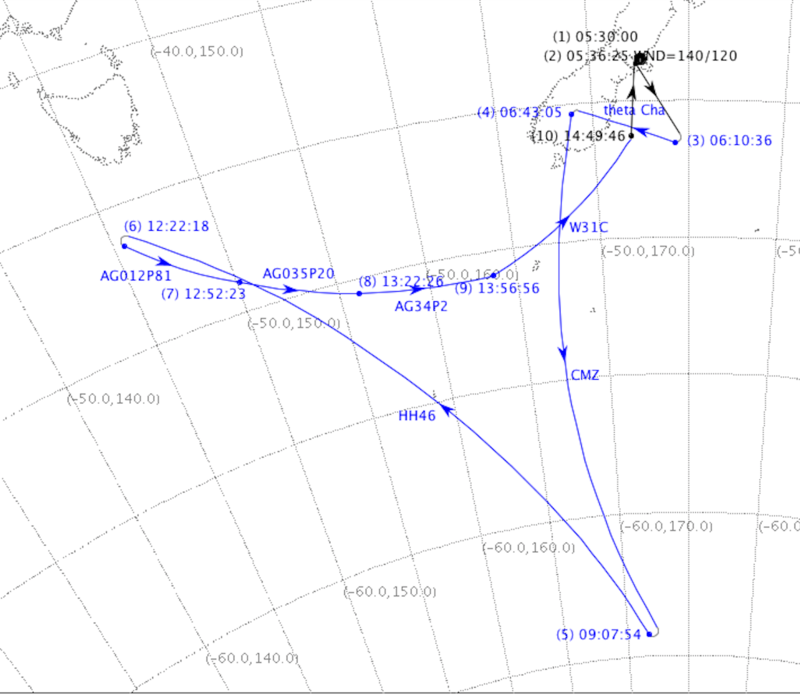 The flight plan takes us very south, in fact, in the flight we reached 64.534 deg. S. Latitude. 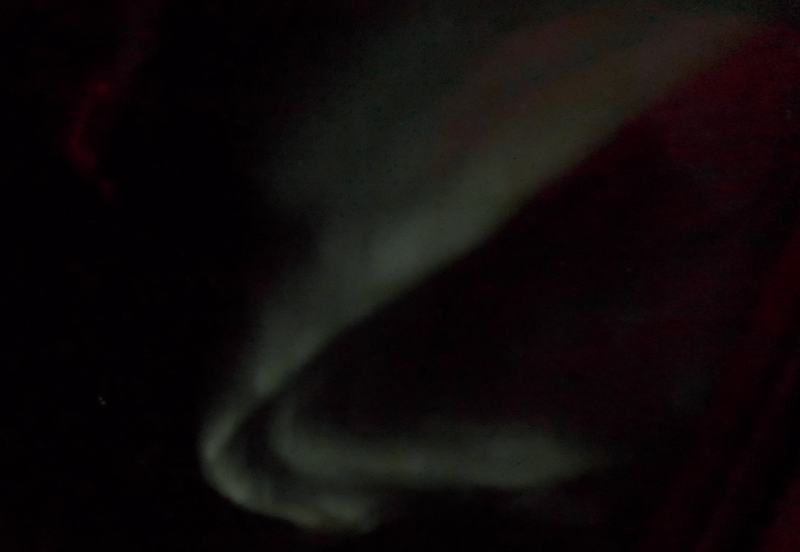 And this delighted us to a show of the southern lights! 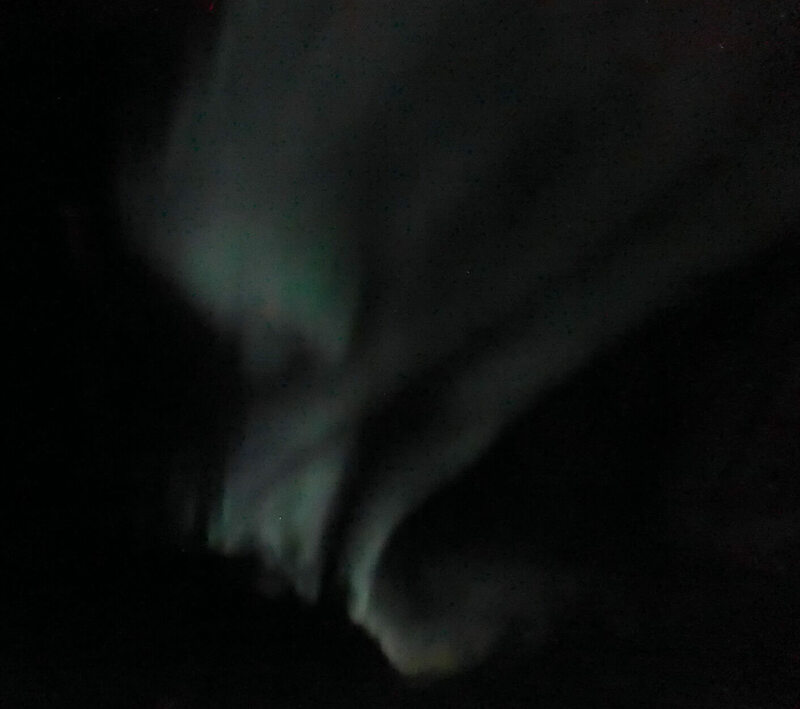 At the end of the 10+ hour flight, the science team disembarked with high quality data at their wavelengths of science need thanks to the very low water vapor at 43,000 feet. 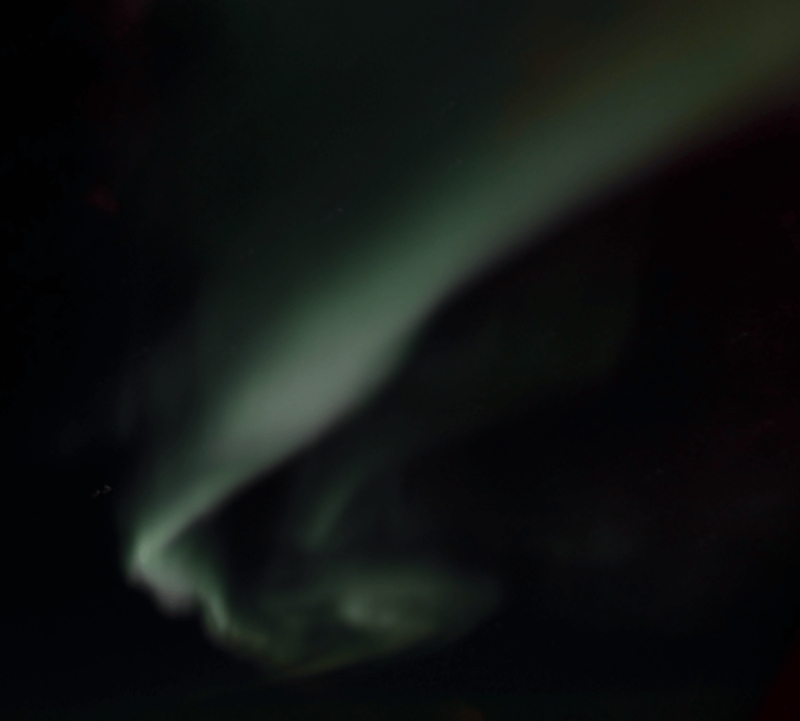 New insights into the role of atomic gas in extreme conditions, like at our galactic center, in jets and outflows of protostars and in the regions of massive young stellar objects. Greetings from the flight line. Kia Ora is a Maori word for “have life be well/healthy” used as a greeting or a farewell and expression of thanks. Tonight team SOFIA met the Vice Mayor Andrew Turner of Christchurch, plus professors from the neighbouring universities and members of the city council and parliament. The evening had a variety of conversations about history, astronomy, rockets (as New Zealand had just recently christened a new rocket launch facility on the north island), and rugby (as the All Blacks were playing the British/Irish Lions, and the All Blacks were ahead during the dinner). After an exchange of greetings, the SOFIA project presented the City of Christchurch with German and US flags (SOFIA is an international partnership between NASA and the German Aerospace Center Deutsches Zentrum für Luft- und Raumfahrt [DLR]) flown at 45,000 feet as a thank you to the city’s support during these southern campaigns. In return a Maori symbol of intertwined two shoots was given to the SOFIA to represent the joining of two cultures. I found myself speaking with a science teacher telling me about visits to science museums and the US Space Camp in Alabama and those trips’ influence on his students, a entrepreneurial woman trying out different Maker-Faire workshops with the University of Canterbury and Polytechnics in Christchurch, an Air Traffic Controller at Christchurch airport loving learning new things when supporting balloon launches by NASA and Google and when SOFIA comes to town, a professor of Maori history at the University, and a former Member of Parliament, and former Science Minister, Honorable Margaret Austin, an educator and biochemist by training, as she related what made her go into politics in the 1980s. A most fascinating evening with loads of conversations cut short as we had to depart by 9pm. My first introduction to the land of Hobbits, is the refreshing rain on Friday June 23rd. Not to mention the cold and wind. With the first realization that maybe I needed more warm gear (she writes, despite her bags being full of fleeces and thermals). Nonetheless, my flask of hot tea, has indeed come to the rescue. After disembarking from SOFIA, going through passport and customs control – I did make sure to toss all my nuts and raisins, and my boots passed inspection. Then a short hop to the hotel, a work telecom (almost on schedule) and I am surprisingly still awake to remember (there is a 19 hr time difference from California), and then some warm tea to warm the inner Kimberly and freshen up. So I make my way down to the Antarctic Research Station, the homebase for SOFIA for these few months. I see the team hard at work, unpacking crates and boxes. We have three science instruments on this campaign, GREAT, FIFI-LS and FORCAST. GREAT was attached to the science instrument port on the telescope for the ferry-flight. FIFI-LS and FORCAST were placed in the cargo hold. All of the infrared instruments need to be cooled such that their detectors can work appropriate and also the thermal radiation from the internal optics does not itself saturate the sensitive detectors. GREAT was transported in a warm configuration, so what happened today was to get it on the cryocooler, a mechanical cooling system (a refrigerator) to get down the instrument to 4 Kelvin. SOFIA’s new capability for science instruments – cryocoolers on the upper deck. The time it takes an instrument to cool down depends on the mass of the volume to be cooled. 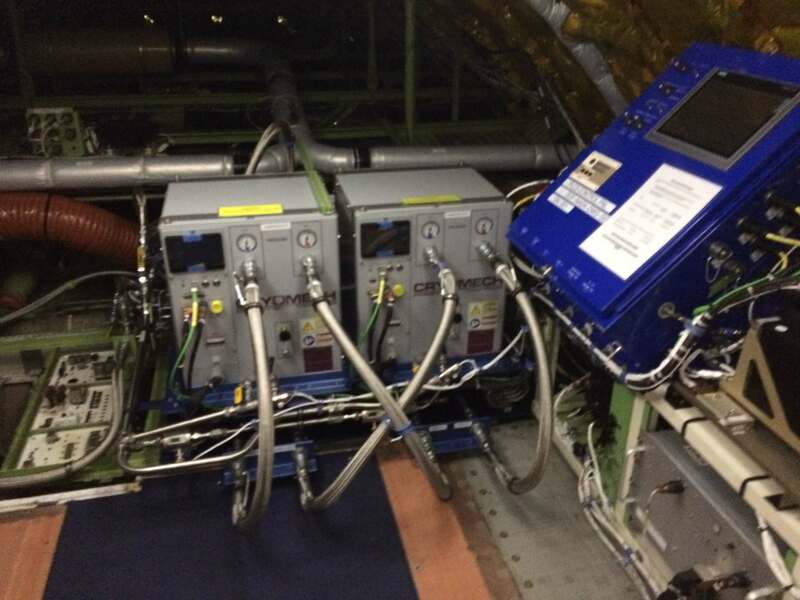 For the instruments on SOFIA, they typically need few days for the initial cooling from room temperature. 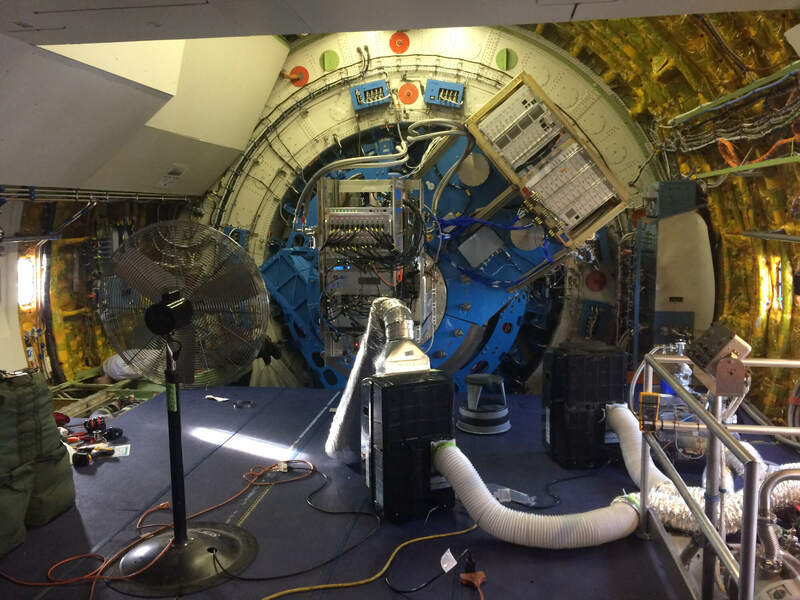 Cooling of the GREAT instrument will occur aboard SOFIA and the other instruments are being transferred from their travel crates to their lab crates to make shift lab areas to get them ready when it’s there turn to fly. GREAT getting a pump & cool down. I hope to explore the city soon. Right now I am in total immersion in learning how the SOFIA team prepares for the first science flight. Okay, I’m gushing. I got to sit in the cockpit of a 747 while in flight and even on landing into Hickman Air Force Base in Honolulu. That was just amazing! The pilot teams are neat. SOFIA flies with 2 pilots, flight engineer and a navigator. 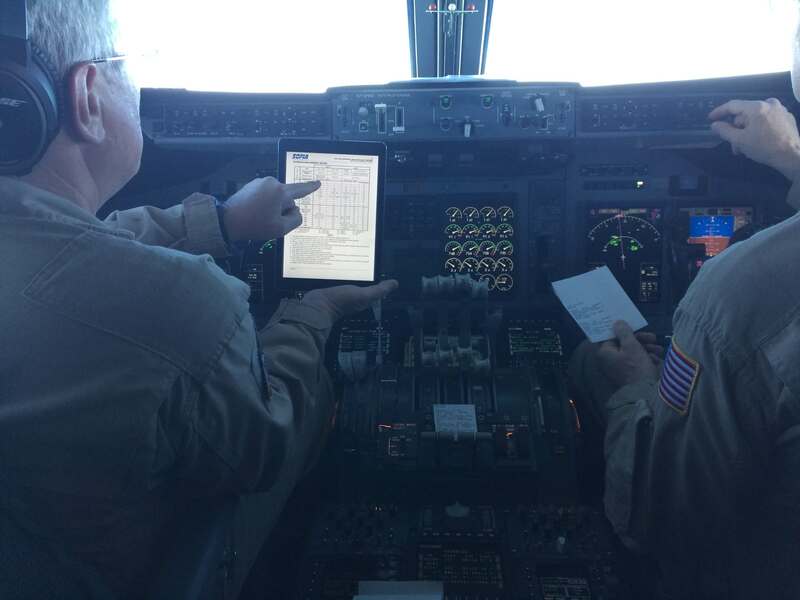 Now, for today’s commercial long hauls, the roles of the navigator and flight engineer have been taken over by combined airplane computer aided by the pilots. SOFIA’s cockpit has been updated with modern navigation tools, but the way the dials, knobs and readouts are configured, if you were sitting in the front seats, you could not see them all. 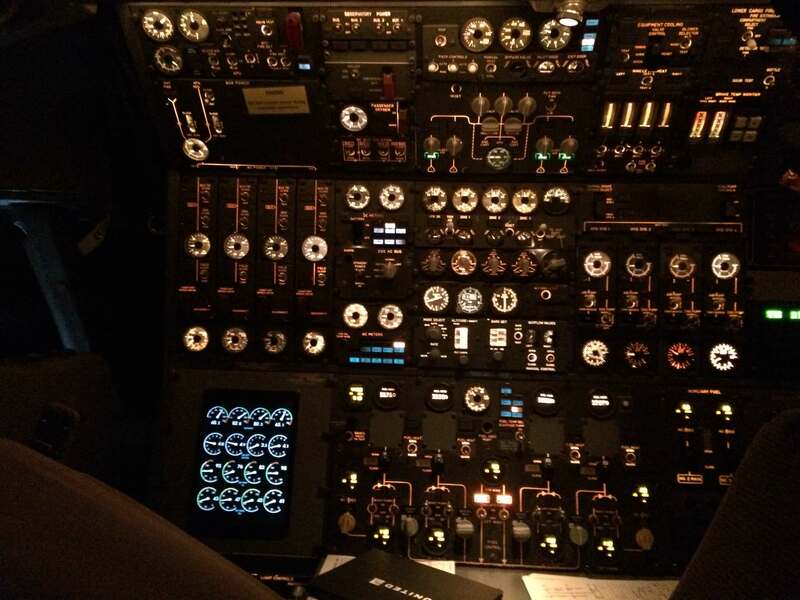 Here’s where the flight engineer comes in, doing engine heats, checking projected speed vs. fuel vs. heading, among many other “background tasks” thinking ahead. It was fascinating to watch those three individuals work, common language provided by the 747SP. When you are far from ATC/air traffic control, the pilots got commands to/from a sat nav system. That was fun to see, as they plugged in their heading or altitude request, and got back instructions to proceed or not. In addition to the weather requests, which got printed out in 20th century means. For the checklists, a variety of modern (ipad) and not-so-modern (pen and paper) plus laminated sheets, were used.